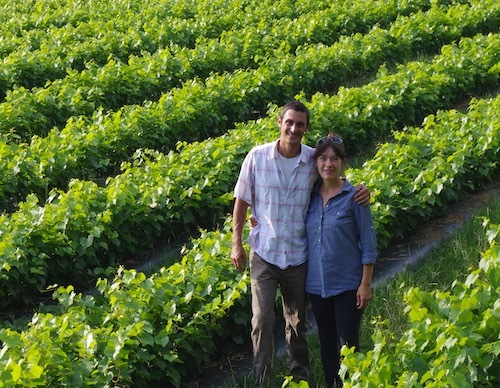 Andy & India Farmer | Northeastern Vine Supply, Inc.
Northeastern Vine Supply has been serving northern grape growers with premium cold hardy grapevines, extensive planting consolation, and custom propagation since 2002. We are focused only on the propagation and sale of the newest and best northern grape varieties. 100% of our time is devoted to quality control of our nursery operations and customer service. We know how important each and every vine is to the future of your vineyard. In our 15 years of service to cold climate grape growers around the country, we are proud to have been part of the release of several new varieties. More than a decade ago, Marquette changed dry red wine in the north. Six years have passed since we helped to introduce Petite Pearl and Frontenac blanc. Now they represent a substantial part of the landscape in cold climate vineyards and are producing award winning wines. In the last few years, we were asked again to be part of bringing new grape varieties to the public. Itasca, a new white from the University of Minnesota, and two new reds from private breeder Tom Plocher, Verona and Crimson Pearl are the latest varieties available from our nursery. Through constant cooperation with renowned breeding programs, we look forward to how these new selections will change our ability to reliably grow grapes in places that just a few decades ago were considered too cold to grow high quality wine grapes. This is all happening at an exciting time in the American wine market, when wine drinkers are more open than ever to try new wines, from new areas of the country. When you need help deciding how to plan your vineyard, put our experience to work for you. We can discuss grape and wine characteristics in depth, soil and site characteristics, and what we see as regional strengths and potential challenges. For experienced growers, we can simply and efficiently provide you with the quality vines that you know you need. We invite you to see the difference our vines and service can make in your vineyard.